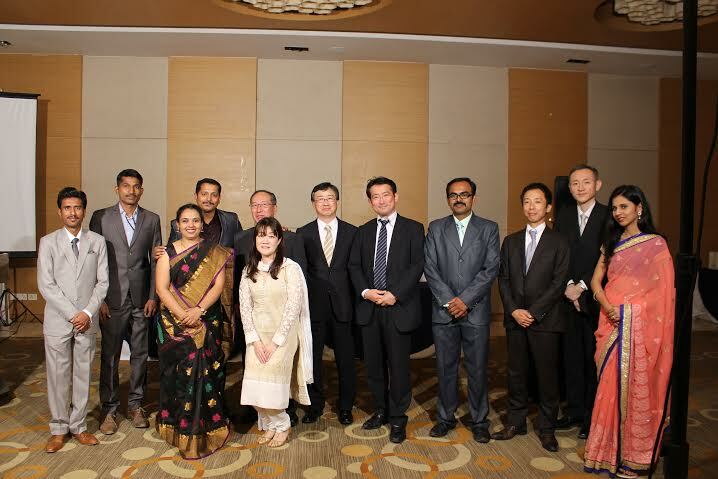 Pune’s nextremer Solutions (India) Pvt Ltd ties up with Japanese Company for global footprint. PUNE: The Japanese Training and Consulting major IT innovations Japan launched their Indian operations on February 25th. Addressing on the occasion, Company CEO Mamoru Hayashi said that the Indian subsidiary would focus on two avenues comprising setting up solutions and consulting IT laboratories which would start rolling out prototypes and scale up to accommodate full turn key projects. The second line would cater towards training corporates across the globe focussing on the next generation high tech research and other research related avenues. Amongst the other dignitaries who addressed the gathering comprised of Mr Ravindra Sonawane, General Secretary Maharashtra and Goa , State BJP Spokesperson Madhav Bhandari , Mr Mandar Kale, MD IT Innovations India and CEO Nextremer India, SME Mumbai Head Mr Muralidharan, MN Devi Associates Head Mr Mahendra Devi, Mr Ohkubo, GM ,Mizuho Bank, Mr Kenji Kimura of MUFG and Mr Hayakawa Manager of Mizuho Bank. Sonawane in his address pointed out that SME’s based in India can solve major socio-economic problems through co-operation from global companaies. India and Japan can learn a lot from each other and have a lot to offer mutually. The young Indians can learn discipline and focus on sheer quality from their Japanese counterparts, he added. MD Mandar Kale in his valedictory note said that the company’s focus would be to collaborate with academicians and institutes and use their expertise to train the corporates so as to help them rise up the value chain. Building capacity for training the corporates and business leaders to transform organizations and create value for the society and the nation was another important area which the company was aimed at, Kale said. Nextremer solutions India which celebrated its third anniversary also launched their framerwork in artificial intelligence and high technology. Announcing the roadmap for the company, Kale said that the focus would be strengthen their positioning as a solution providers and partners in Japan and also diversifying into USA, Europe and African continents. Nextremer Solutions India pvt Ltd was founded in 2012 to develop innovative productivity tools for the world market and providing offshore development services, next generation technology and consulting solutions to the global IT industry. In India, we have a development facility in Magarpattacity, Pune. Additionally, we have a business development office in Japan. Our array of services includes Product Engineering, Enterprise Business Solutions and Value Added Services. Nextremer Solutions specializes in the implementation of what is popularly termed as the Offshore Development Center (ODC) model. Mr Mandar Kale is known in the industry for his pioneering work in developing and maintaining business with the Japanese and APCC markets. He has been instrumental in incubation of startups, BOT models etc. He excels in strategizing, leading delivery teams, thinking globally, and managing relationships. Mandar has over 15 years of experience and specializes across various domains viz. Manufacturing, e-commerce, R&D, Artificial intelligence, Education and learning and Automobile. Mandar also consults in agile Development and is passionate about technology innovation, Software Development and Implementation. He has a distinction of working in reputed companies across Japan, USA, Singapore, Australia. Mandar has a Masters degree in Computer management and Masters degree in Business Management. He is fluent in English, Japanese, Hindi and Marathi.